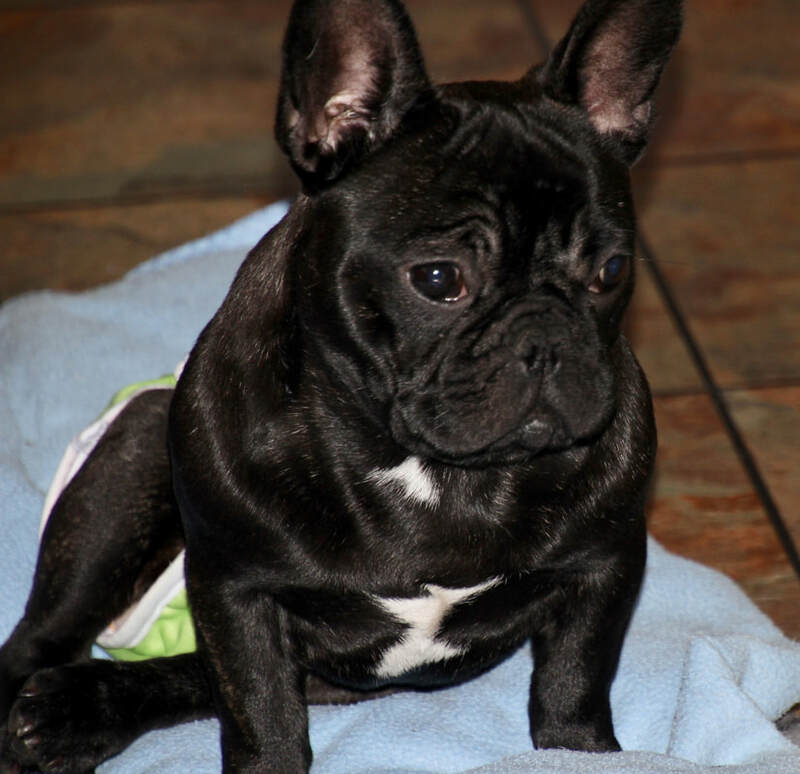 You can help a French Bulldog in need by sponsoring a respite. 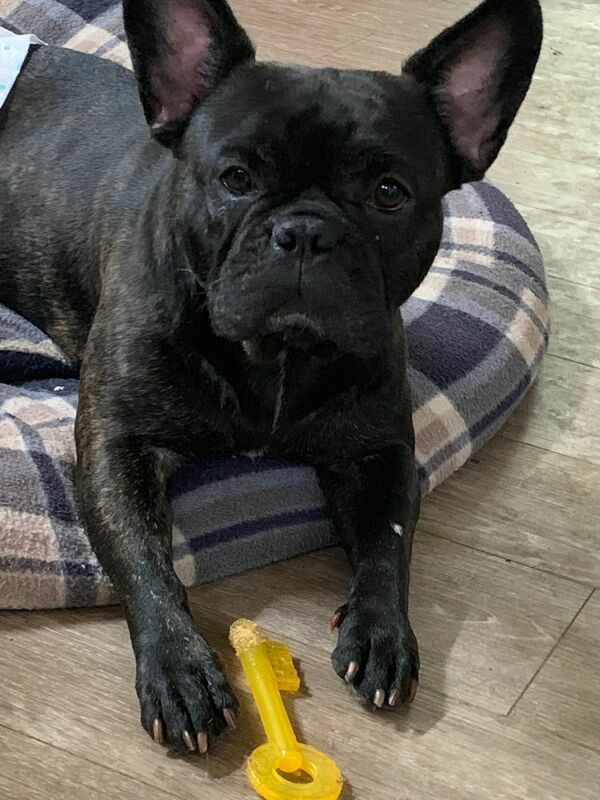 Our rescue is dealing with with an increasing number of very sick, handicapped and often mature Frenchies that cannot be re homed in their current state. The veterinary and long term care as well as the cost of medications and specialised food for these precious souls can put quite a financial drain on our resources....we rely heavily and are forever grateful for your generous contributions so we can keep caring for these beautiful dogs! If you would like to help you can sponsorthe respite care of these beautiful dogs. Any amount helps and donations can be made monthly/fortnightly/weekly or as one off donation. You can use the Sponsor Now button to the right of this page to make a once off donation. Please email us at fbrescue@gmail.com so we know who you are! We are a Registered Charity so all donations are tax deductible!!! Please take the time to scroll through these beautiful dogs and Sponsor the love of your life!!! Sweetie was handed in as a puppy with the belief that she had Hip dysplasia but on further inspection and tests it was discovered that she had Spina Bifida, she has little control over her bodily functions so most of the time she has to wear a nappy inside...she also has a lot of issues with her hind legs and paws for she walks like a kangaroo and has to be closely monitored....she can only wear dogboots for a while due to irritating her skin. Overall she is a kind and happy dog with a lovely dispostion that loves her little half-sister Pies, the two of them are inseparable, they give each other confidence and of course the much needed 'cuddle buddy'. There seems to be some secret language between them for they spend a lot of tome just staring at each other and when they come inside, they lineup to have their nappies put on!! We have noticed that since reaching her near to adult size she has got weaker in her backend and being quite a large and longish dog this may cause issues to her mobility, if that is the case then we will most definitely look into getting her further assistance in the form of a wheelie cart. PiePie or Pies as we like to call her was handed a couple of weeks after her half sister, Sweetie, who also has Spina Bifida but poor little Pies got the rough end of the stick...apart from the SB she has far less control of her bladder and bowels than Sweetie...and also she has Hip Dysplasia, Patella and Neurological issues and to top it off, Epilepsy! We have fixed her hips, patellas, got her soft Palate and got her desexed, she is also on medication for her Epilepsy which we seem to have under control, she is very prone to Urinary tract infections and her bladder does need to be expressed every 2/3 hrs....she also wears nappies during the night as well as on the colder days and she can't go outside. Pies is much steadier on her feet than before but the Neurological issues can make her unsteady at times for she veers to the right a bit, the body wants to go one way and the head wants to another way so get these little black eyes staring at you from the side a lot. Anyways the decision was made that Pies is probably better of staying with us, she has her friends here and they are so patient with her and she loves them as long as they do what she wants...with all that disability going on she still is a little bossy boots!! 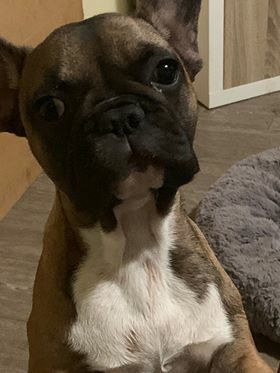 Connie was surrendered as a 9 week old pup, we knew that something wasn't quite right with her from the start, she was quiet and reserved, a little bit away with the pixies so to speak. 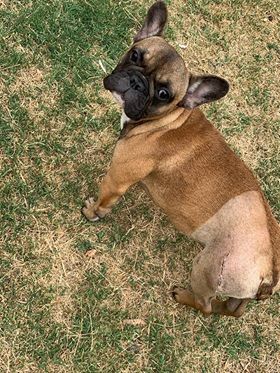 We could feel clicking in her hips whenever we picked her up or she was on your lap but we thought, young pup lets just wait a while and see if she grows into her bones, unfortunately as time went on this was not to be the case so we got one the hips operated on with the other to be done later on in 2019...she did not cope well with the anesthetic nor with the recuperation. In the meantime we were aware of her eating and bowel habits, forever hungry but whenever she ate it came out the other end quite quickly so she always remained very thin, she played about 10 mins in the day and the rest of the time she basically slept or sat and stared at you. We are now working getting her gut right with meds and the appropriate food, this will be a long process of eliminating what foods work for her and how much we can reduce her meds so she can continue to thrive. Indie is one special lady, she was around 2 yrs old when she came to us is 2018 with a few issues, she had injured her back and the previous owner went ahead and did all the surgery but did not have the time to put in the rehab which is required for a full recovery and sadly by the time we got her she had very limited use of her back legs and she was incontinent....we did try though, weeks of driving an hour and half there and back for 15/20 of water treadmill therapy and hrs of walking around the block in a sling and yes there was an improvement but not enough that she was stable. We then got her her her very own Wheelie cart and then Indie shone, she loves her cart! She is still incontinent so she has to wear a nappy around the home but she is happy, very happy...she is the Mother hen of the clan and she towers over everyone so its kinda fitting that she has that role and she takes it very seriously. Indie has found her joy, she loves greeting all the new faces and showing them the ropes, she loves showing off her wheelie cart to all the people that she meets...a friend once said she has 'human eyes'...he is so right! FinnyFull of it!! !....Finny lives life to the full with all her imperfections, she is a song and dance all on her own! Well, we cant sugar coat this in any way, Finny is a bit of a mess.....Curvature of the spine, tongue too large for her mouth, crooked jaw, dietary issues, partially deaf, elbow dysplasia, hip dysplasia and grade 4 patellas that cant be fixed because she has no knee joints- she is being held up by ligaments! She requires a specialised diet because of her severely wry jaw Finny has difficulty eating. She also has an oddly shaped head and eye placement so focusing is done on an angle. In her defence dear Finny has no fluid on the brain and has normal heart function and even more importantly she has the spirit of a Lion. 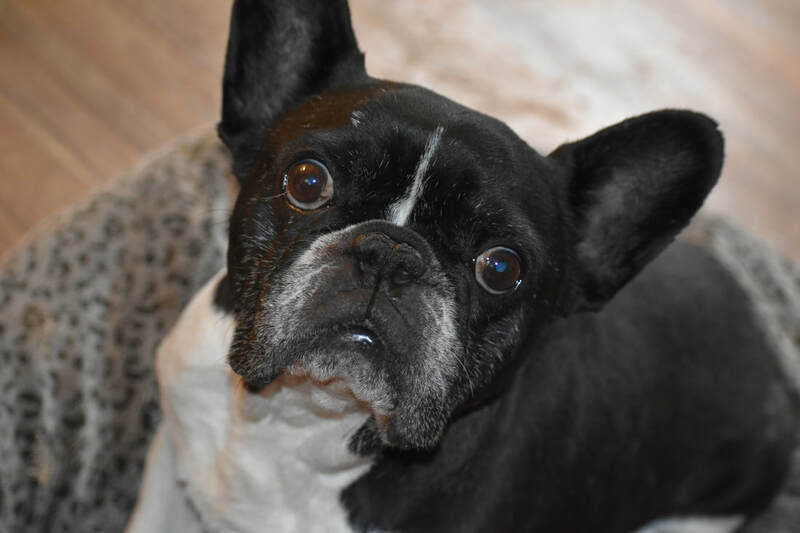 We have had Finny's soft palate and nose done to improve her breathing and swallowing, on the whole there is nothing more we can do for her. She is what she is, we don't know how long Finny will be able to function but we would guess that her back ligaments will give out eventually and she might have to have a set of wheels to get around. Bruce is the most beautiful of souls and one of the most endearing dogs you will ever get to meet but sadly he comes with some issues so we may as well get them out of the way first and then we tell you what a magnificent dog he is. His back legs tend to wobble and on occasions when standing still he trembles..this is because the hemivertebrae in his back and neck are pressing up against his spinal cord, he is not in any pain and we will be trying him him on a low dose of cortisone to see if that will improve his mobility. We have quite a number of dogs through but I don't think I have seen one so appreciative of a warm bed and a few toys, he just smiles all the day through. 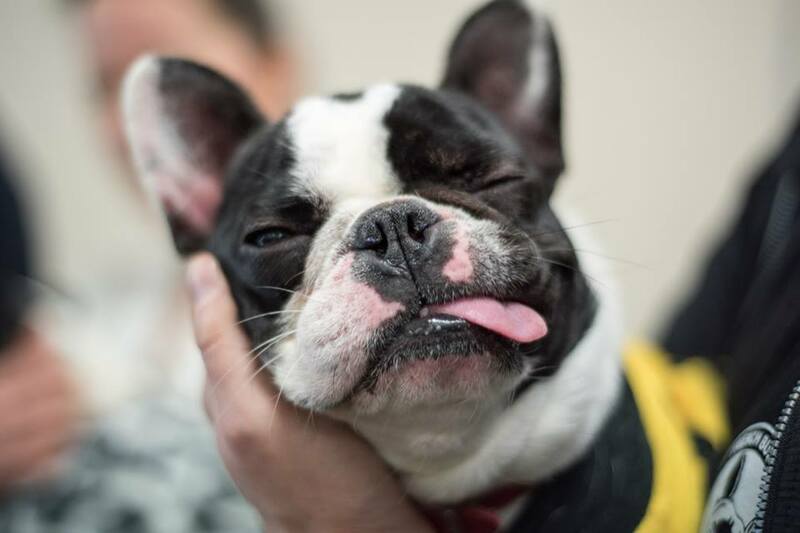 Bruce now has been desexed and had his soft palate/nose done.